Hereos Hideout of Albany, New York was part of a private signing with WWE's Becky Lynch. 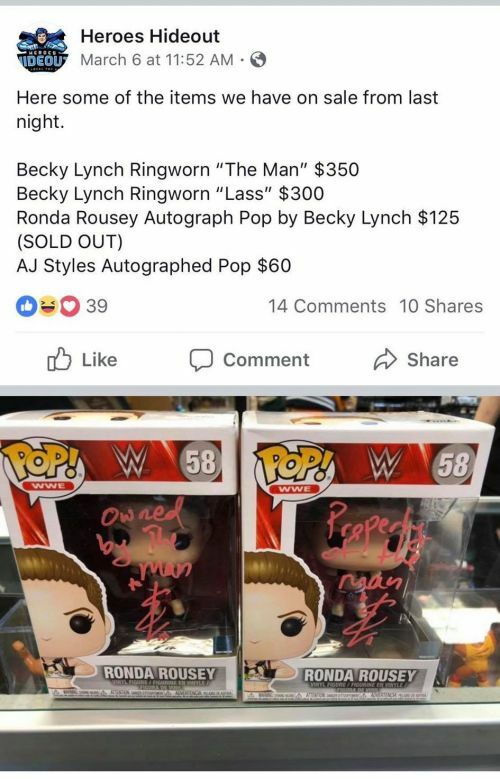 During the singing, Becky Lynch signed two of Ronda Rousey's Funko Pops. The feud between Ronda Rousey and Beck Lynch dates back to Evolution. Becky was scheduled to face Ronda at Survivor Series. Unfortunately, Lynch was injured and unable to compete. Since then, Lynch personified herself as, "The Man." Tensions between the two have been rising ever since. Now, flash forward to The Royal Rumble. Lynch lost her match to Asuka making Asuka the new SmackDown Live Women's Champion. That match would not be the last we see Lynch that night as she would go on to win The Women's Royal Rumble. On February 4th's Monday Night Raw, Lynch would be suspended for hitting Stephanie McMahon. The following Monday Night Raw on February 11th, Triple H and Stephanie McMahon informed Becky Lynch that her suspension was lifted and she’d be allowed back into her earned a title match at WrestleMania against Ronda Rousey, but only if she apologized for attacking the McMahons. After receiving advice from the roster throughout the show, Lynch came out to make her decision at the end of the night. Becky then apologized as instructed, but Vince McMahon came out to say he didn’t accept. Furthermore, Vince announced Becky was now suspended 60 days. 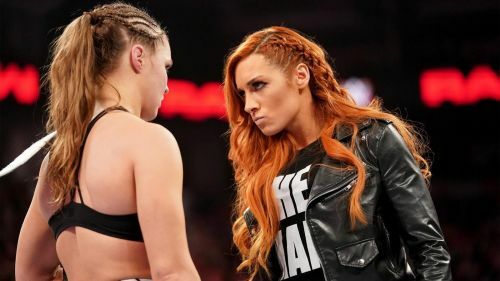 Meaning, Becky would be suspended after WrestleMania 35. Thus, Vince announced her replacement — Charlotte Flair. Lynch was removed from the match but was given a chance to win her sport back if she beat Flair at Fastlane. Well, lucky for Lynch, and fans, she won the match which has led to WrestleMania Raw Women's Championship match a Triple Threat match Ronda Rousey versus Charlotte Flair versus Becky Lynch. Becky Lynch has been taunting Ronda Rousey on Monday Night Raw, SmackDown Live, Pay Per Views, and all over social media for months now. Lynch is doing everything she can to get in the head of Rousey. Recently, she signed Ronda Rousey Funko Pops. One says, "Owned by The Man," and her signature. The other one says "Property of The Man," and her signature. Note: Screenshot was added after the post was taken down. We only have a few more weeks until WrestleMania. Only time will tell what antics and antagonizing Lynch will pull to get into the head of Rousey.